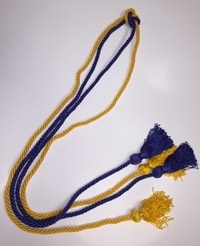 Braided Honor Cords with tassels in gold and royal blue. The medallion is available to current Beta Kappa Chi members in good standing only. 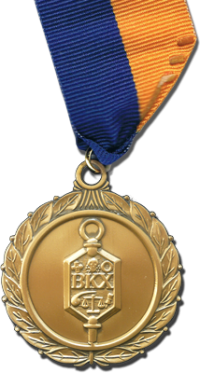 This medallion is finished in gold-colored metal suspended by a ribbon in the society colors of gold and royal blue, and is supplied in a presentation box. This annual subscription is payable by graduate or faculty members of Beta Kappa Chi. This subscription provides libraries with copies of the BKX Bulletin for archiving purposes and public use. This annual subscription is required by undergraduate student members of Beta Kappa Chi after their initiation year. Graduate members should pay the graduate subscription.